Slate flooring to handle and supervise the task of packaging in a systematic order. Thus, there are minimal chances of damage from our end as our experts check the entire lot before dispatch.For the utmost convenience of our customers, we ensure that the transaction is done only under the stern supervision of experts and professionals. This makes our payment procedures more secured and transparent. We are manufacturer and supplier of slate flooring tiles from India. With having our own quarries and processing units for slate we can supply bulk quantity within very small span of time. We have imported machinery for different types of finish for slate flooring tiles. 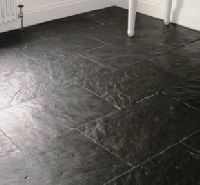 We can supply all types of Indian slate flooring tiles with very competitive price.